The Sinopoli Family has a long history of cooking on the Mississippi Gulf Coast. Charlie Sinopoli, eldest of four brothers developed one of the coast’s favorite restaurants, Popp’s Ferry on the Back Bay in Biloxi. Brothers, Himbert, Raymond and Gary Sinopoli helped in creating the family like atmosphere many coast residents cherished. The fresh seafood and grilled steaks were their specialty but the all you can eat chicken, fish, spaghetti, nights were a favorite for growing families. The four brothers were forced to make career changes after a fire destroyed the building. The local community knew of their connection to the food service and hospitality industry. Himbert and Raymond Sinopoli were each recognized by the Board of Directors of the Gulf Coast Chapter Restaurant Association, at the Chefs of the Coast Food & Wine Festival. After a long absence from the restaurant industry, Gary & Charlie Sinopoli researched and found the farm raised catfish industry was growing in northern Mississippi. The brothers wanted to serve a limited menu, open abbreviated hours and keep those customers coming back. They discovered a building built by the Dedeaux Family and once used by Mr. Ward who served whole catfish fished from the surrounding ponds. He closed due to illness. The Dedeaux Family used it for storing furniture they built when it was discovered. The warmth and charm of this rustic country style building was perfect for the menu items they wanted to serve. 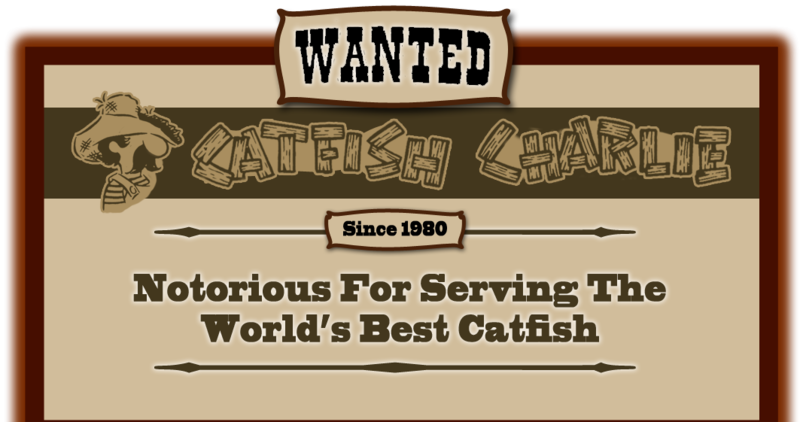 Since 1980, Catfish Charlie has served three main items, farm raised catfish, chicken filets and gulf shrimp. Our home style cooking and commitment to prompt service have allowed a third generation of family members to continue cooking for South Mississippi.